This morning we woke up docked in Karlstadt, an unknown little place that has a Viking dock. 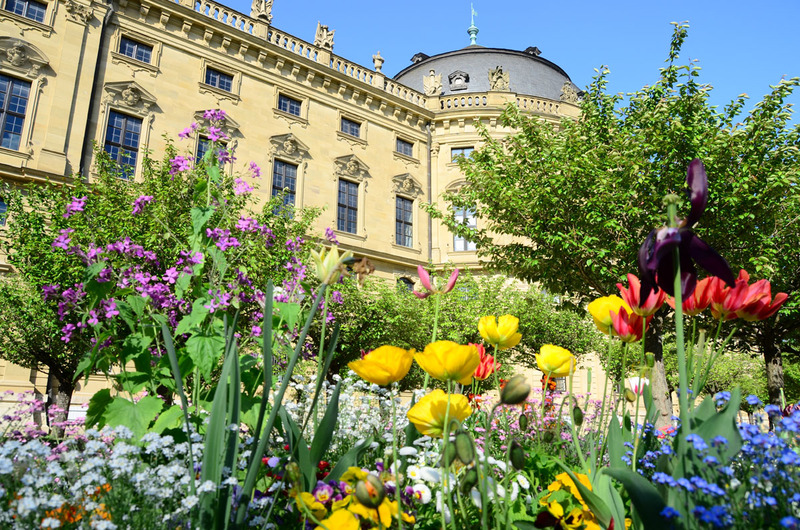 The standard included tour was of the town of Wurzburg and the Prince-Bishops’ Palace called the Residenz. Instead, Gerry and I signed up for an optional tour to Rothenberg ob der Tauber. 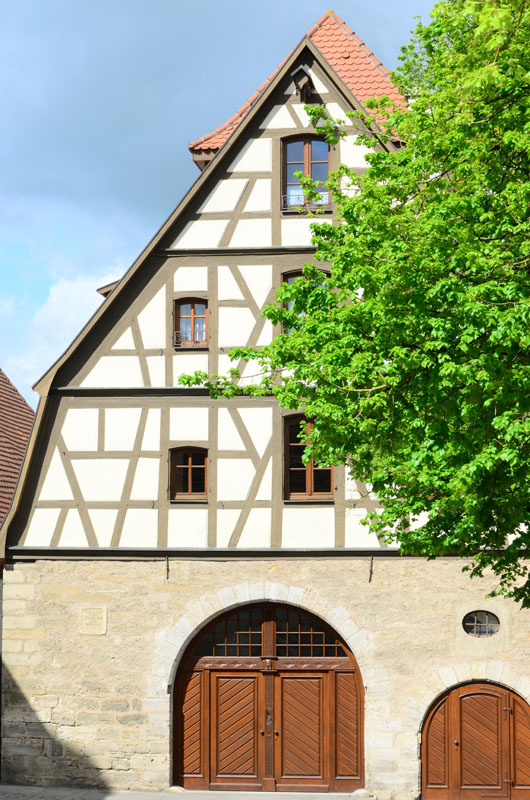 This was a variation on the half-timbered house style that we only saw in Rothenburg. 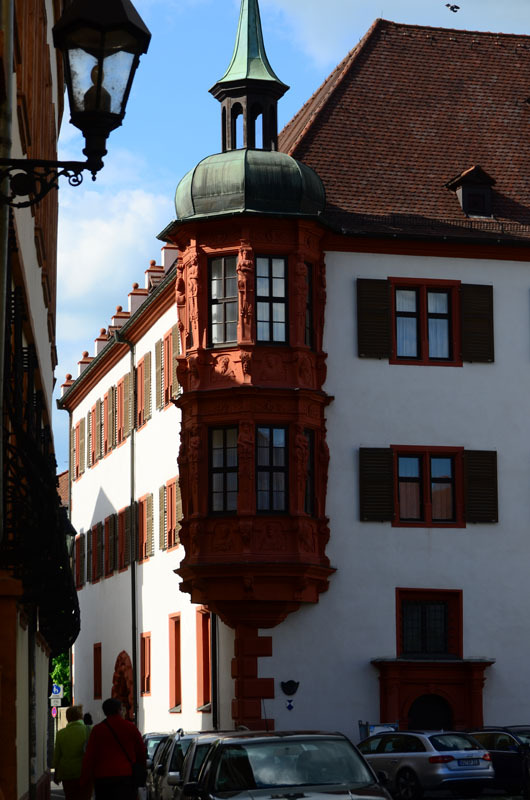 Our bus route took us first to Wurzburg, and then onto the “romantic road”, an idyllic stretch of road through the pastoral countryside of Germany, once the subject of odes, poetry, prose and art in the 19th century. Then it was a rutted gravel road, but now a quiet, but smooth asphalt highway. The scenery was breath-taking! 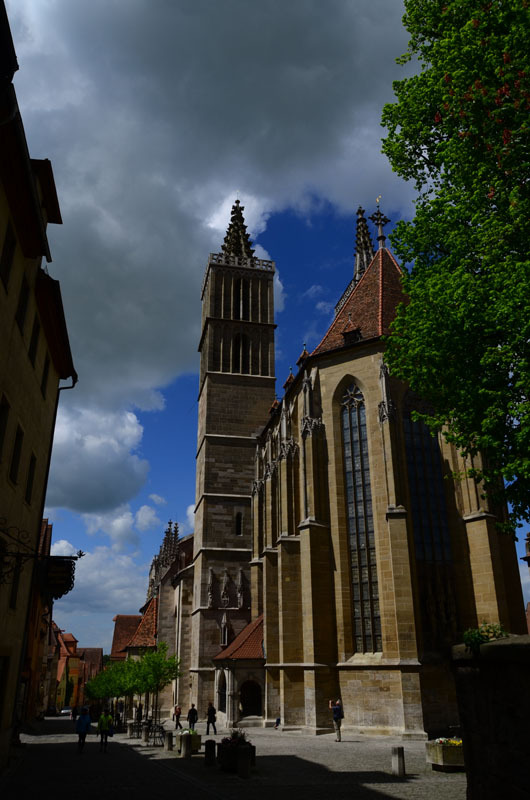 Once in Rothenburg, we toured the city with our guide. Here again, we are in the middle of a medieval city that is well restored. Surrounded completely by ancient walls, Gerry and I managed to ascend the stairs and walk along the top of the wall. The top is covered (sometimes the roof is low enough to hit your head) and you can peer out the occasional archer’s slit to the outside, or you can peer down onto the houses and street of the inner town. It is an interesting perspective on the town that you shouldn’t miss. 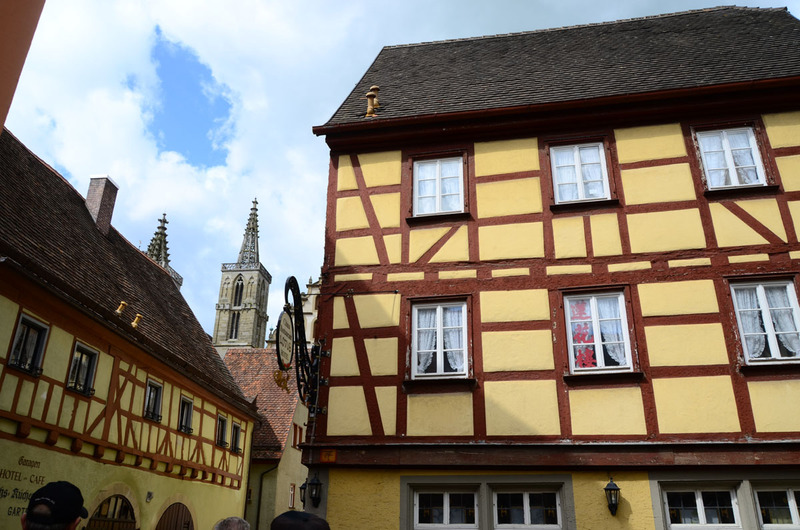 Rothenburg has half-timbered houses, too! Besides our tour, we had some free time to go shopping – but that didn’t yield much. There was one very famous store in the town – and the wares from that person’s store (Kathe Somethings Christmas Store) were in all the stores, and you couldn’t find much of anything else! 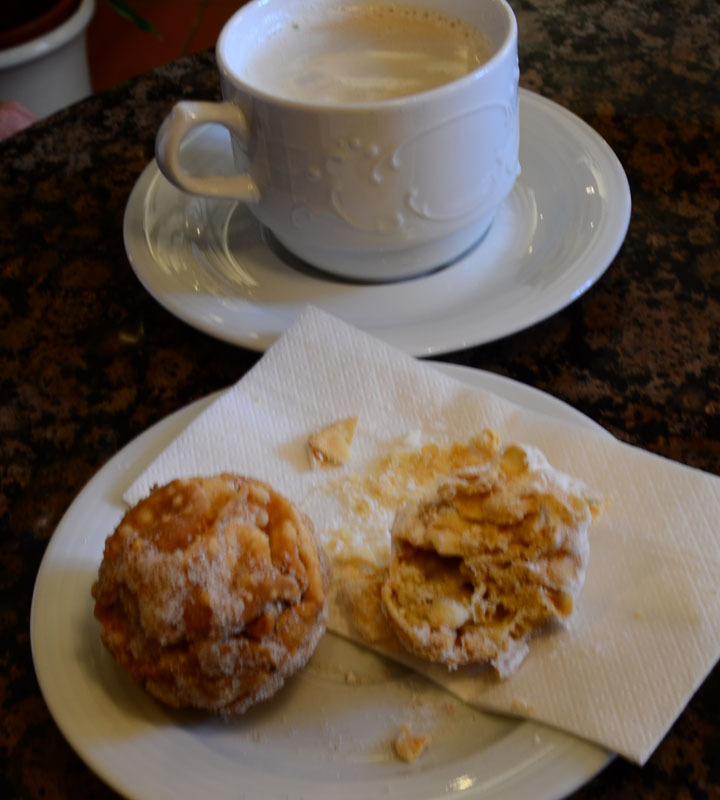 We did go into a pastry shop and try the local specialty: a schneeball, or snow ball, a fried pastry dough ball covered with cinnamon or powdered sugar. Yes, it was good! 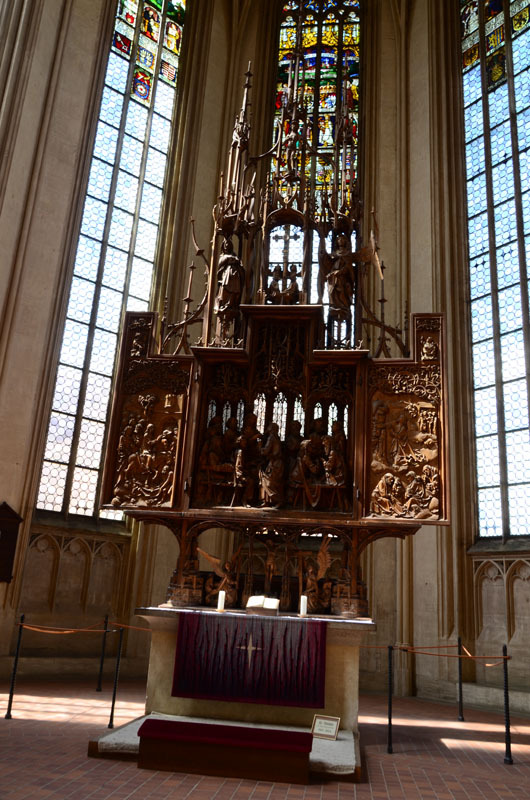 We also returned to the St. James’s Church after our tour, to see the work of the wood carver, Tilman Riemenschneider. Upstairs in a beautifully stark chapel is his Heiligblutaltar, done in 1504. This enormous work is as airy as lace and is carved with amazing delicacy. Though the guide book referred us to the expressive faces of the figures on the altar, I noticed the intricate details of the natural elements like vines and branches and leaves. It is definitely worth finding if you are visiting the city. As part of the tour, we also had a homemade lunch in a family restaurant. The family also grows and produces wine, which we got to sample with our lunch. I did not care for the wine (first one I have tasted in Germany that I would not order again.) The luncheon fare was copious and hearty – sauerkraut, mashed potatoes and bratwurst! 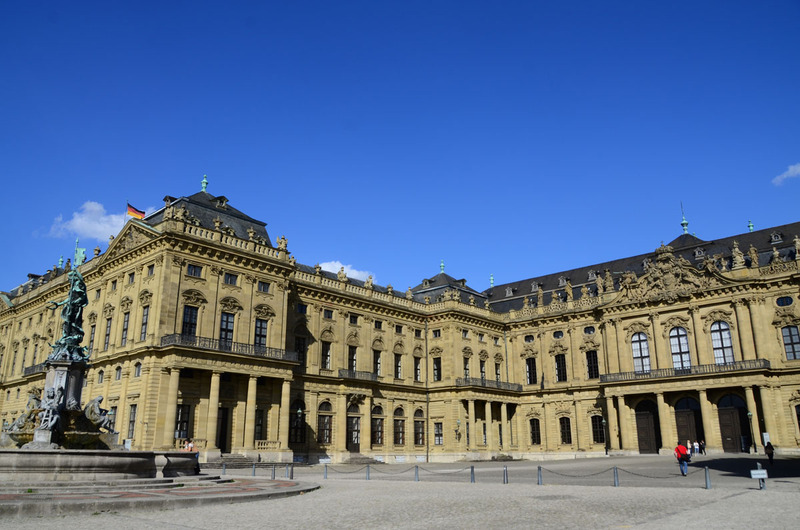 Following lunch, we re-boarded the busses and drove back up to Wurzburg to see the Residenz, the 18th century Baroque palace of the bishop-princes. So glad we did! This is an amazing palace! Do not miss it! The structure seems enormous, but I suppose it might pale in comparison to Versailles or the Hermitage. The entrance is marred by a huge parking lot that covers the square in front of the structure. We entered via the same entrance that carriages would have entered the building and ascended a huge monumental staircase, just as visitors to the palace would have entered in its heyday. Built to impress, it still does today. The ceiling of the staircase was a marvel in its day and caused the architect no end of ridicule. However, he ended up with the last laugh. Even when the palace was bombed in World War II, the ceiling did not cave in! The ceiling was painted by the Italian fresco painter Tiepolo. The subject is the four (then known) continents. The continents may have been known, but not much about them, apparently. The images for the Americas are pretty funny – there is even someone riding a giant crocodile! For me, the most amazing room we saw was the White Room with the stucco decoration by Italian Antonio Bossi. I was awed. This room has been restored, because it was destroyed in the WWI bombing. There is no way I could tell if the original was anything like what we saw, but what we saw was amazing. The variety and depth of the relief on the ceiling decoration was mind-boggling. I think I could have stayed for hours admiring it. We were forbidden to take any pictures inside and I did buy a postcard of the ceiling so I could use it to show you, but I doubt that will do it any justice at all. The other rooms we saw had also been restored and included a famous room decorated with painted mirrors. Though the rooms are quite gaudy for modern tastes, I am sure that visitors to this palace felt that they got more than they bargained for after the long journey to arrive here. We also peeked into the adjoining palace gardens, before walking back to the ship. Though tonight is actually the second to the last night on the boat, we have the Captain’s Dinner and reception tonight. The reception gives us the opportunity to applaud the staff of the ship, all of whom have been over the top helpful and friends during the entire course of our cruise. 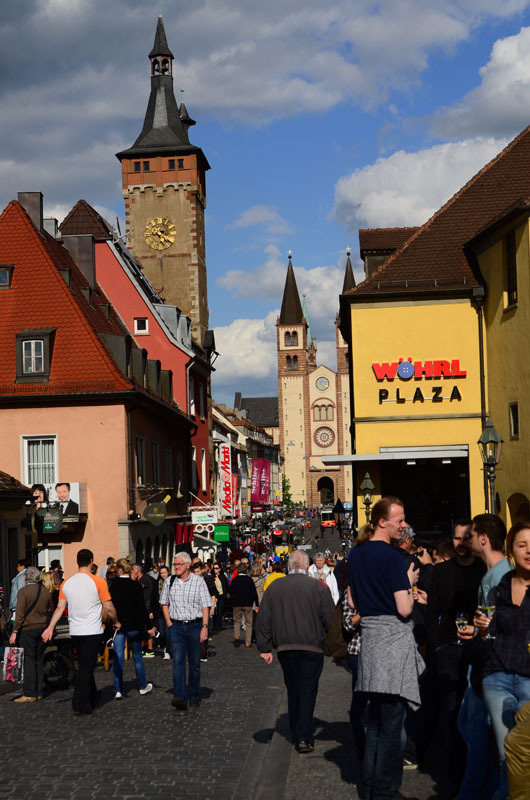 Picture of the town of Wurzburg – pretty lively! everyone on the ship is coughing. The first days of the tour, I noticed there were a few coughers, but it seems to have spread to almost every cabin. I have had a horrible sore throat that keeps getting worse, and Joanne, Gerry and Rod are all coughing, too. You might have wondered how we could all manage to get sick – but I will just say that this river cruise is anything but relaxing. It is exhausting. You are so often off the boat on some excursion, that the idea of cruising down a beautiful river is just not part of the picture unless you simply choose not to go, or as in the case of some of us, just can’t. I have gotten to the point where I cannot even make it through dinner, or dream of spending time in the lounge with fellow passengers like we did earlier in the week. It was also about this time that I came to realize that the better option for this Viking itinerary, is to start in Prague. Almost all of the highest rated sights on this trip are at this end of the cruise. Better to start in Prague and, while fresh and enthusiastic, see the great sights. Then relax and stay on the boat for all the tiny towns on the Moselle which, in retrospect, were probably not worth so much time and effort. Stay with me! Keep reading! 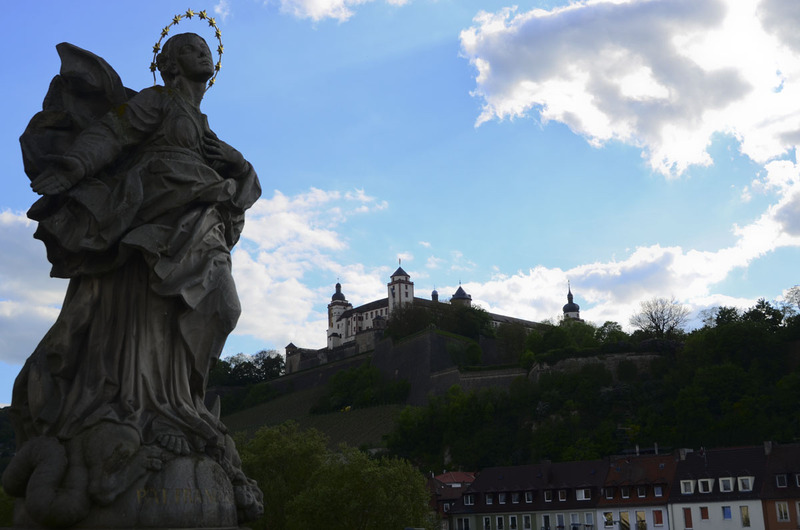 From the Wurzburg bridge, looking up at the town’s castle. Thanks for alerting me that I forgot the link. Hopefully you found your way already to the subsequent days.